A search for two people reported to have been trapped in a floodwater culvert pipe in East Sussex, has been stood down. Crews were called to the scene, in Bexhill Road near St Leonards seafront, just after 14:00 BST. 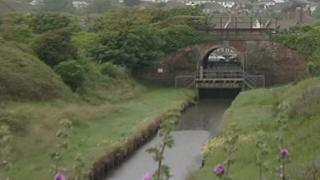 Police said a man walking in Cinque Ports Way had reported a man and woman trapped, after hearing voices through a drainage pipe. Fire crews went into the culvert but could not find anyone. Sussex Police and the coastguard had also joined in the search, which was stood down at about 18:15 BST. Sgt Stella Wells, from Sussex Police, said: "After receiving the report of two people trapped, we did all we could in the rising tide to find them. "It is possible that the voices the man heard were an echo from people standing outside the pipe. "We haven't found the people and the specialist search team will make a search of the culvert at low tide as a precautionary measure."